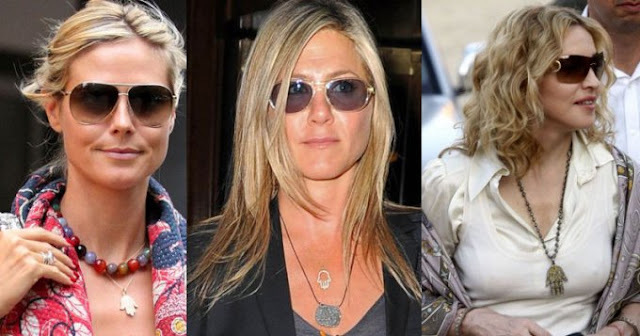 Alright, it’s time I address something that has been bothering me… what the hell is up with all this “evil eye” jewelry?!? I first discovered a kiosk adorned with evil eye paraphernalia 5 years ago. My husband told me that it was a Jewish thing, and thus I passed it off as “not for me” (since I'm not Jewish). However, in the past year I have witnessed tons of celebs and bloggers sporting these symbols. I decided it was time to investigate. Isn’t it funny how we can let ourselves wonder about something for so long before we just Google it? I have done just that, I have Googled over 15 different articles explaining the meaning behind the ever so popular evil eye jewelry. Historically, it's symbolism dates back to ancient Greece and Rome. A belief in the evil eye is widespread throughout many cultures. The Middle East, Asia, Europe, and Central America all fear the evil eye. However, allow me to try to explain the idea of the "evil eye" juxtaposed to the evil eye jewelry. Many different cultures, dating back thousands of years believe that there are evil people who can wish harm to you and your family with a stare... aka the evil eye. 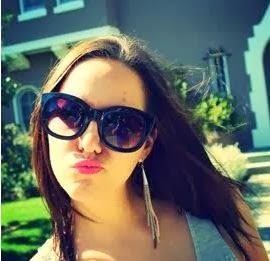 Many believe that with fortune and success others become jealous and thus wish ill-will upon you. So... in order to combat that negative energy, one must wear evil eye jewelry as a good luck charm and token of protection. Does that make sense? 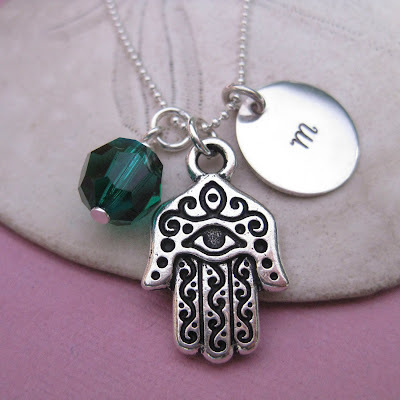 In order to protect oneself from the evils of the evil eye, you must wear an evil eye charm? See why I had to read so many articles to figure this out?? Okay, and to make matters even more complicated, some cultures have merged the evil eye with the hamsa. If you've seen an evil eye charm, then I'm sure you've seen one encrusted on a hand.. aka a hamsa. The hamsa is one of the most powerful examples of the evil eye amulet in the Middle East and Africa, also known as the “Hand of Fatima.” The hamsa is an ancient Middle Eastern amulet symbolizing the Hand of God. In all faiths it is a protective sign. It brings it's owner happiness, luck, health, and good fortune. The hamsa is a hand-shaped symbol sometimes displaying the evil eye on the palm. The hamsa is believed to provide defense against the evil eye. How do you feel about evil eye jewelry? Did you grow up in a culture that believes in it's power? My family believes in the evil eye. It's very common in Caribbean cultures (we're Cuban). We call it "mal de ojo", and it's seen as something that someone can cast on you either intentionally or unintentionally. In fact, if someone compliments you on your hair, for instance, and the following day you happen to notice that another gray hair has just popped up, mal de ojo might have taken place. Or if someone says they like your shirt, and then at lunch you get spaghetti sauce all over it. Or something worse, like everyone tells you how great your kid is and then all of a sudden the kid starts acting out all the time. I had two different sets of eyes around my neck growing up. It's very common for Cubans to invest in small gold necklaces/chains with saint pendants on them. 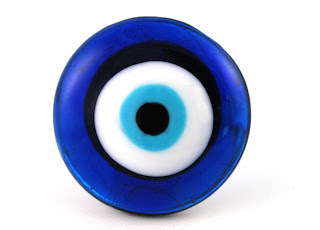 First I had St. Lucia's eyes, then I got an evil eye from a Greek Festival added on (the blue one pictured here). Here in Miami the evil eye jewelry is treated like a hamsa. I think it's all a bunch of hooey but the jewelry is super cute. Lol. I never really thought about what the meaning behind it is. Thanks for the explanation! Yes! I am originally from Uzbekistan in Central Asia and people from that part of the world are VERY superstitious, which is why the evil eye is such a big thing. We have a saying "don't let the eye touch you" and wearing the evil eye can help with that. In my culture, if one of the evil eye beads breaks, they actually say that that was it protecting you. I've had so many lil beads fall off, so I say a little thank you to my jewelry for saving me! Kind of cool, huh?